This is a session that focus’s on possession with an overload and the transition in gaining and losing possession. The session is set up within an area approx 15-20yds x 15-20yds. The game is set up as a 6v3. The ball will always start with the team with the greater number. The objective for the team in possession is to maintain possession without the opposition getting contact on the ball or forcing a mistake. The objective for the team out of possession is to force as many mistakes or getting a touch on the ball as possible with the allocated time. The session is set up as within the previous session. Within this session the objective for the team defending is to win possession either by gaining possession or forcing the team in possession to put the ball out of the area, which would then see the ball played to the team with 3 players. Total number of passes made within the allocated time. See Diagram 2. The session is set up as within the previous session. For this session four goals are introduced, one being placed on each side of the pitch. The team that are defending (less players), when they win possession of the ball they are now looking to score in one of the four goals. See Diagram 3. The playing area is 3 zones one large middle zone with 2 end zones. Both teams set up in a 2-3-1 (however they can set up in any formation you wish) and if you have extra players use them as feeders outside the end zones to play the ball into the middle. The aim is to win the ball high up the field as possible and dribble or receive the ball inside the opponent’s end zone. Look for the triggers of the ball being passed to one center back. As this is occurring the striker cuts of the line to the other center back and presses the ball to win. This small detail should tell the striker to get close enough to the center back to win the ball rather than stop before reaching the center back. The rest of the team uses the same trigger as the striker (as well as the striker’s movement) to compact the area and restrict space making it harder for the team in possession to retain the ball. Below we see all players have come over to almost half the size of the playing area. This clearly leaves space on the opposite side for the balls to be hit too, so players must pressure the person on the ball instantly to not allow that to happen. If they are late, then there is a possibility it will happen and therein lies a coaching point for the team/individual. When either winning possession off of a tackle or a misplaced pass, the objective is to get the ball into the end zone by either dribble or receiving a pass. However, a coaching point should be to recognize where the space is before making this decision. If there is no space, then the team should go backwards to maintain possession. The press should be applied for a short time period because it is high energy and players can’t sprint flat out forever. I would suggest the Barcelona 6 second rule that if the team pressing doesn’t win it inside of 6 seconds, their defending objective changes from pressing to dropping and containing to deny penetration, either until the team wins possession that way or they see an opportunity to press again. • To connect passes in a composed manner in a tight area in front of goal. The playing area is twice the size of the 18-yard area with the defending team set up in a 4-2-3-1 without the wingers or striker. The attacking team is in a 4-3-3 formation without the defenders. There are two neutrals outside the area. When the attacking team start with the ball all players must stay in the boundaries of the 18-yard area. The defending team stays compact to stop penetration and frustrate the attacking team. When they win the ball, there needs to be instant transition to open up the field. The FB’s are allowed outside the area to stretch the field but no other players are. The CB’s should drop down and out to get into as much space as possible. It is important that the player that wins the ball, because the team is in the defensive third, is careful with their pass selection. The connection of these passes is critical not just of the first pass but until the team is able to play the ball forward to either the neutrals or up to the level of the neutrals while still in control of the ball. What you are trying to educate the players on is to move instantly for the player on the ball into areas where pressure can be released while remaining composed and not rushing the decision. Encourage the attacking team to press when they lose the ball to simulate game speed and scenarios. It is then up to the team in possession to maintain their cool and play simple passes to release the pressure from their defensive third. 1) There should always be the option of playing back to the GK and because the FB’s are allowed outside the area the GK can switch the ball to the opposite side. The FB can then dribble up. Make sure the defensive line also pushes up to simulate the game. 2) The player on the ball can either find the neutral on the ground or clip the ball over the top of the pressing attackers. 3) If the pass has not gone to the FB straight away, the FB’s need to understand that they are an outlet and move again to be available for the team to play forward. Both teams play with 2 central midfielders, 2 wingers, an attacking midfielder and a striker. There are 4 gates, 2 on each corner of the area and a line of flat cones in the middle to help the player visualize their objective. The aim is for the team that starts with the ball to score in one of the goals by dribbling through it. The defending team condense the area to pressure the attacking team into making a mistake as well as restrict passing options. The striker cuts off the pass to the other center midfielder, the winger presses while cutting off the pass to their winger. This gives the player on the ball less time to make a good decision. The attacking midfielder steps in front of the opposing attacking midfielder the central midfielder on the opposite side comes across to cut the pass to the striker off and the opposite winger tucks in to help compact the space around the ball. When the defending team wins the ball, they can attack and (1) dribble through the gate if it is on, to give them 2 points or (2) pass centrally and dribble pass the line between the gates for 1 point. When the defending team wins possession, the objective is then transferred to the team who has just lost possession to stop the now attacking team from changing the point of attack. They do this by again cutting off passing lines and pressing the player on the ball to force mistakes. Area Size: Largest grid is 20 X 25. Inside grid is 12 X 15. Goal is full size and 15 yards from outside largest grid. Teams: Groups of 2 for possession and individual target strikers (can be midfield target players as well but functionally can be placed further from goal). Setup: · Field is set up with a 20X25 space as shown in the diagram. A middle field is set up as shown where the players will play 2 vs. 2. Goals can be set up as shown or other arrangements depending on desire of the training session. Three players on each group with rotation groups waiting or multiple fields. Players play 2 vs. 2 inside the restricted space. After a series of passes or on cue from the coach either team tries to find the striker who has been constantly moving to align himself/herself to receive a pass. After the successful pass to the striker the player attempts to score on full size goal. • Run a striker at both ends as shown in diagram or only at one end. Area Size: Largest grid of 55 yards by 55 yards. Middle grid of 35 yards by 35 yards and innermost grid of 15 by 15. Coach can adjust depending on age of players and objective. Taking risks and connecting passes can often be counter to each other. This activity will help players find good connecting passes under pressure and in a fairly chaotic setting with many other movements happening at the same time. This activity emphasizes connecting passes while under controlled pressure (level of pressure controlled by coach). The athletes will need to move to position themselves for connecting passes by short movements. This movement and communication necessary under strict pressure of time and space can have a great effect on connecting passes in game settings. Two groups of six to seven players occupy three grids one inside the next (see graphic below). The idea is for the group on the outermost grid to connect passes to the group on the innermost grid. Start off with each of the outer players possessing a ball to attempt to pass into the center grid. The middle grid is occupied by defenders who cannot leave their grid but works to intercept passes that come through their grid. The focus is on the outer grid group of players for feedback from the coach. Their movement around their grid is essential for finding the line of passing that will enable them to connect with the inner grid. This means the coach can give feedback on keeping the head up, keeping the ball moving and looking for opportunities. The key cues essential for connecting passes of posture, eye contact and verbal communication are essential as well and the coach can focus on those cues. Players rotate grid locations with their group after a time limit or after all of the starting balls have been knocked out of the grids by the defending group. – Add goalkeepers to the inner group for receiving with their hands. – Add goalkeepers to the middle defensive group who can use their hands to intercept passes (increases difficulty for the outside group). – Add competition with consequences for the losing groups by counting the number of completed passes before their balls are knocked out by the defending group. 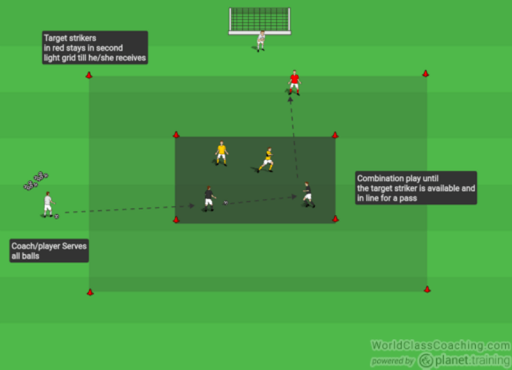 – Reintroduce balls knocked out and play for time only and count completed passes. – As balls are knocked out of play by the middle group the players on the outside grid can combine passes together before attempting to pass the ball to the inner grid. – Players may attempt to dribble through the middle grid and a player in the inner grid must then switch places with the dribbler on outside grid. Two grids side by side are set up each with full size goals. Field size is 20 wide by 25 long. Two teams on each field set up to play against each other. The black team with five attacking players compete against four defensive players in yellow. If the black team scores they get 5 points per goal. If the yellow team intercepts the black team tries to win the ball back in four seconds. If they are unable to do so, the yellow team earns 5 points. If yellow can score on goal during their possession then all of the points the black team has accumulated goes to zero. Yellow does not get points for scoring. All play starts with the ball from the keeper of the black team. Always play make it take it. Every four minutes two players from the black team move to the yellow team. Once every black player has changed a full cycle will have been completed. Run two full cycles. Black team can only attack the opposite goal from the last one scored on. The teams are set up as shown with four black attackers vs. four yellow defenders. The red team is lined up on the outside of the field. Full sized goals with keepers. Teams play four vs. four in the space. The black team attacks the one full sided goal and the yellow team attacks the other full sided goal. The red team is played in by either team but cannot participate until played into by one of the teams in possession. Once possession is lost by either team the red team drops back off until played in again by one of the teams. AS SOON AS ONE TEAM SCORES, THE RED TEAM TRANSITIONS ONTO THE FIELD AND THE LOSING TEAM MOVES TO THE OUTSIDE. The scoring team gets the advantage of make it/take it and tries to score again during the transition of the red team arriving on the field. Copyright text 2019 by Coaching Advanced Players.